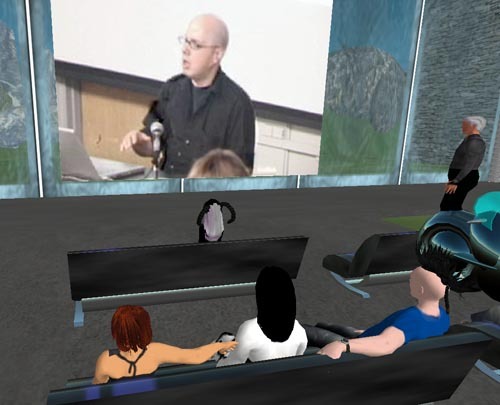 The Ars Virtua New Media Center (Dowden, 45,59,51) has been simulcasting a series of Speaker Salons taking place at the The CADRE Laboratory for New Media at the School of Art and Design at San Jose State University. I attended the most recent, featuring CADRE lecturer James Morgan. Rubaiyat Shatner (right) and J0E Languish take a break from their chores. The talk was followed by a Q & A from both CADRE and SL audience members. There are still two Salons remaining on the roster. No preregistration is required for attending in SL. The Vacuum Cleaner show was inspired by, among other thing, the sad condition of the carpeting in Gallery Aferro’s current building, a donated former furniture store. There is something highly pleasurable about viewing two artists ceaselessly vacuum an immaculate, dust free space. I may have cala lillies on our front desk for the opening reception to match the digital ones I saw in their machinima.